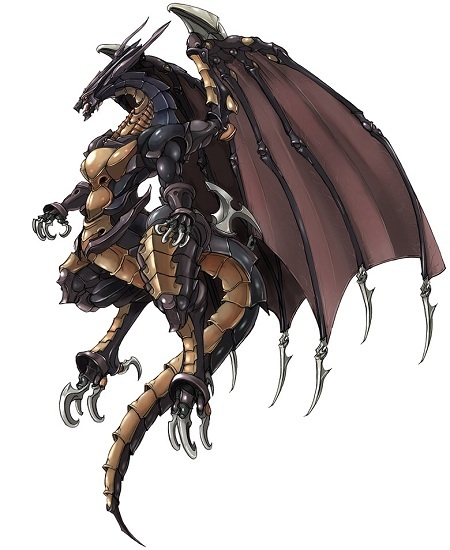 Nightmare is a very imposing, large bipedal black dragon. In his past, he was a grand dragon of almost unbreakable scales and unmatched masculinity. However, due to a lone warrior; calling himself a Dragon Hunter, he was defeated in battle. His body was ripped and torn asunder. Over a period of a century, he was restored back with metallic replacements on his body. His power has dwindled since then, but still remains as one of the strongest of all Draconeans. His life has been extended by his mechanical power cores, protected by scales of weathered adamantine. Due to his past, Nightmare is a very cold and unrelenting individual. While not always volatile, he will mercilessly attack and kill all of those he believes to be threats. He has a very distinct amount of distastes. Those include insolence, disrespect, and weakness. The latter of the three will usually make him angered, but not enough to initiate an attack. However, any attempt at his life, no matter how small, will result in his relentless retaliation.